Would you Hire Santa? Believe it or not, you might learn a thing or two from ol’ Saint Nick about conducting a strategic job search. Think about this: in good and bad times, Santa has been in demand for over a hundred years. Though we are seeing a glut in talent and there are more job seekers for every job posted, people seek Santa out every December for the busiest and happiest time of the year. In fact, he is finding employment earlier each year – sometimes before the ghosts and goblins disappear and the kiddies finish eating their treats. 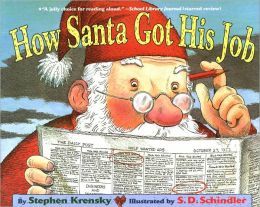 What does Santa’s Resume look like? Santa identifies the perfect toys and gifts for all the children around the globe. Almost everyone in the United States celebrates Christmas, regardless of their faith, so he is in big demand. People not only need his services but they want more and more of it as we spend more on Christmas each year. Brilliant job of identifying a unique niche, Santa! Santa’s product lines have changed over the centuries but he keeps current with modern trends and tastes. He delivers what he promises because he prepares far in advance of Christmas. He monitors the behavior of children all year long and his elves analyze the data with positive precision. How can you relate to this step? Make sure you do your own research of positions, industries and professions in order to target 5 – 10 for your own job search. Being laser focused can make the difference between applying to hundreds of posted jobs and being selected based on your concentrated efforts. Your research pays off when you can customize your resume and cover letter. Santa is the networking ninja! Everyone who is anyone knows Santa or is connected to him through someone else. His linked in profile connections exceed billions and he has more endorsements than any of the other 332 million on the most successful social media site for professionals. The key to Santa’s networking success? He is a giver and not a taker. You can be too; when making a connection, always remember to ask how you can help before indicating you would like assistance. Zappos might have the market on corporations delivering happiness but Santa delivers happiness to the whole world. Santa has branded himself as the global delivery support of happiness. What’s your “career brand”? Knowing the answer to that question is key to your job search success. ← Fifty Years Old and Searching for your Ideal Job?